Triac or Triode for alternating current is an electronic device equivalent to two silicon controlled rectifiers joined in inverse parallel (but with polarity reversed) with their gates connected together. Like SCR, Triac is also a three terminal device. The MT1 and MT2 (Main Terminals 1 and 2) terminals are used to pass current in either direction while the third terminal G ( gate ) is used to send trigger pulse to the device. 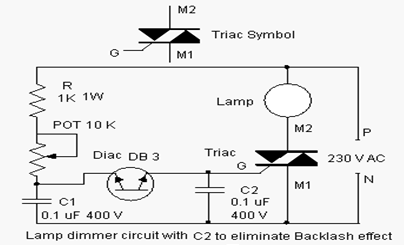 Triac can be triggered by either a positive or negative voltage applied to its gate electrode. When the voltage on the MT2 terminal is positive with respect to MT2 and a positive voltage is applied to the gate, the ‘Left SCR’ in the triac conducts. If the voltage is reversed and a negative voltage is applied to the gate, the’ Right SCR’ conducts. Minimum holding current ‘Ih’ must be maintained to keep the triac conducting. AC or DC pulses can trigger Triac and four modes of triggering are possible. 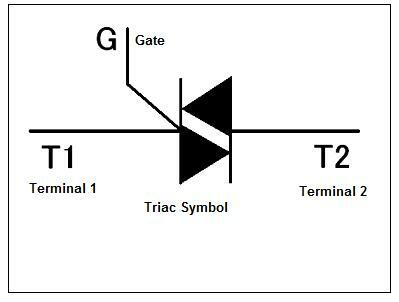 Between the MT1 terminal and gate of a triac, an’ Internal capacitance’ exists. If the MT1 terminal is supplied with a sharply increasing voltage, it causes enough gate voltage break through to trigger the triac. This condition is referred to as ‘Rate Effect’, an unwanted effect caused mainly by the high transients in the AC line. Rate effect also occurs when the load is switched on due to high ‘inrush voltage’. Rate effect is severe particularly in driving inductive loads such as motor because the load current and voltage are ‘out of phase’. An R-C Snubber network will minimize the rate effect and makes the switching clean. The R-C Snubber network is connected between the MT2 and MT1 terminals of triac as shown in the figure. A serious ‘Control Hysteresis’ or ‘Backlash’ develops in triac controlled lamp dimmer circuits, when the gate current is controlled by a variable potentiometer. When the resistance of pot meter increases to maximum, the brightness of the lamp reduces to minimum. After this, the lamp never turns on till the resistance of the pot meter is reduced to a few ohms, say 50 to 70 ohms. This occurs due to the discharging of capacitor connected to the Diac. When the triac fires, capacitor discharges by the Diac and generate the ‘backlash effect’. This problem can be easily rectified by connecting a 47 to 100 ohms resistor in series with the Diac or adding a capacitor (C2) to the gate of the triac. This capacitor (C2) will slow down the backlash effect and the full turn effect can be obtained. The connection of capacitor is shown in figure.